Mirror mirror on the wall, here's the fairest favor of them all! Our fairytale themed hand mirrors are sure to be a big hit with your guests. Perfect for a bridal shower, Sweet 16 party, or any other special event that needs a royal finishing touch! 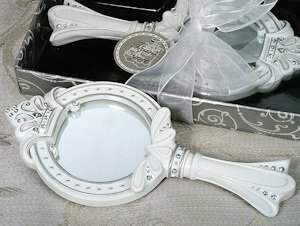 Each mirror is made of durable white poly resin and is designed with a tiara top encrusted with jewels. We package them in a black bottom gift box with clear top then tied with a ribbon and finished with a fairytale themed thank you tag. Mirrors measure 3" x 6". Is there a waiting list I can get on? I'm sorry we don't have a waiting list. How big are these hand mirrors? The Sparkling Tiara Hand Mirror Favor measures 3" x 6". How much inventory is still available?